Declare your independence from poor performing pens with the Monticello Gift Pens and Pencils. 1.00 mm Ballpoint. 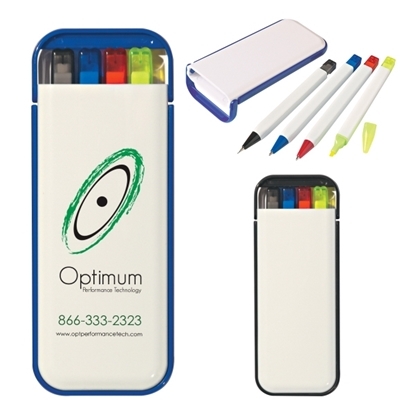 The Vendome A Highlighter Pen has single color printing in an assortment of colors. 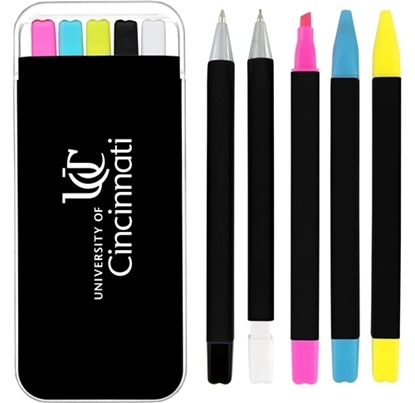 Pocket pen, pencil and highlighter all in one case. All metal pen & pencil. Retractable mechanism. Pen has medium point black refill. Pencil has #2 refillable lead. Individually sleeved box. Laser engraving, not available on silver barrel. The Regency Grip Metal Above & Beyond Laser Engraved Pen has single color printing in white. Ribbed thumb grips and chrome accents. 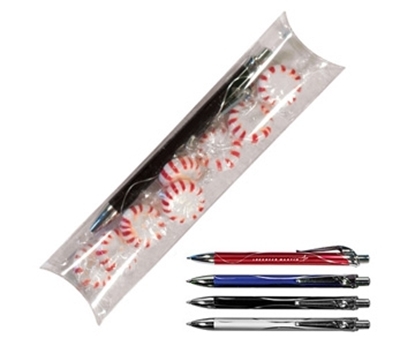 An above and beyond gift displays your chosen pen surrounded by 8 Starlight Mints in a clear pillow box. The Cirque Metal Above & Beyond Laser Engraved Pen has single color printing in white. 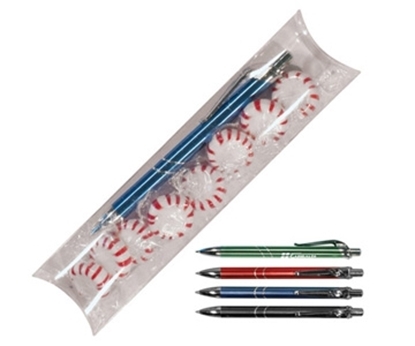 An above and beyond gift displays your chosen pen surrounded by 8 Starlight Mints in a clear pillow box. The Saturn Metal Above & Beyond Laser Engraved Pen has single color printing in white. 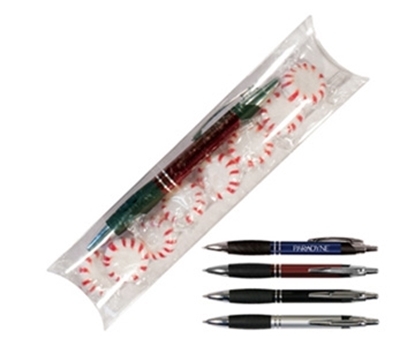 An above and beyond gift displays your chosen pen surrounded by 8 Starlight Mints in a clear pillow box. 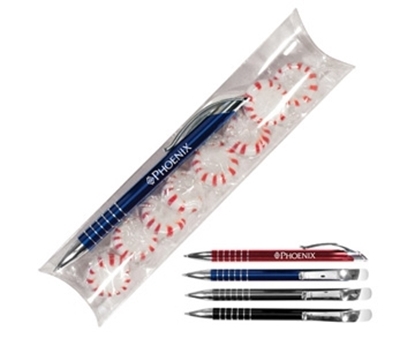 Go with the "write" promotional option for a variety of events with this 4-in-1 writing set. 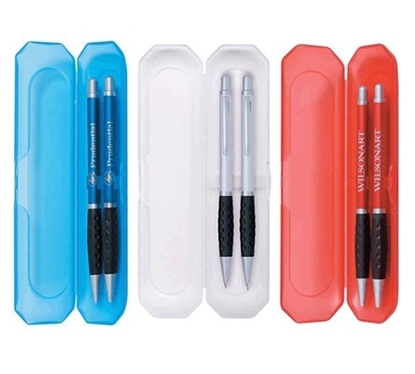 This handy set features a mechanical pencil, a yellow highlighter and two pens - red and blue - in a convenient pocket case. Jot in erasable lead, ballpoint tip or vibrant highlighting ink and keep up with fast-paced academic courses, meetings and more. It's all contained in a convenient pocket case and can be customized with an imprint of your organization's name, logo and advertising message. Let this pen do the talking for you and the result will be a convincing message. A sleek design with four corporate barrel colors that induce you to pick it up every time you write. Select either gold or chrome trim and ball pen or ball pen/pencil set to fit nearly every gift scenario at an attractive price point. Plus, Paper Mate branding above the clip communicates quality and style that will influence your audience. Experience the Paper Mate Persuasion. 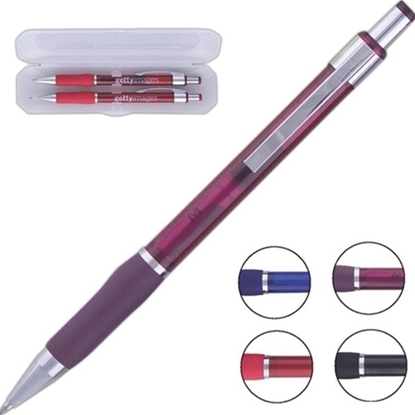 Mypromotionalpens.com offers the largest and best priced selection in Promotional Gift Set Pens. We will price compete and we won't be under sold. 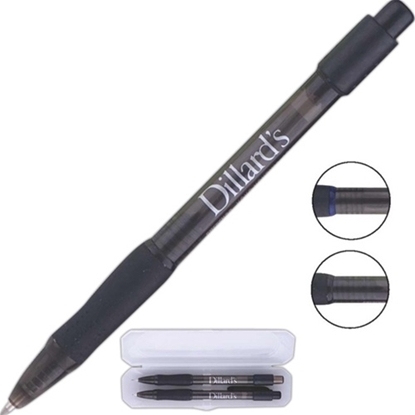 Let our graphic designers make your personalized Gift Set Pens standout above the crowd at no charge. We won't stop until you are completely satisfied with your custom Gift Set Pens art proof.Use category search filters on your left to help narrow your search to find exactly what you are looking for.